Can the expression of conviviality act as a reminder of everyday acts of kindness? Solidarities outside the box. All rights reserved.With constant news about growing islamophobia and anti-semitism, and the rise of right-wing movements and parties across Europe and the world, the media is dominated by stories documenting and trying to understand our ‘age of anger’ as the essayist Pankai Mishra has called it in his recent book. Public displays of anger, anxiety and resentment hold our attention. In a political climate shaped by uncertainty and competition, the social is increasingly understood in ethno-nationalist/monocultural/religious terms and the ability to live together in diversity is thrown into question. In a recent survey by the 2017 Aurora Humanitarian Index, for instance, which was reported in the Guardian found that ‘more than half of Britons believe their culture is threatened by ethnic minorities living in the UK’. Such situations allow for ordinary and unspectacular encounters with others in which difference is routinely rendered insignificant. 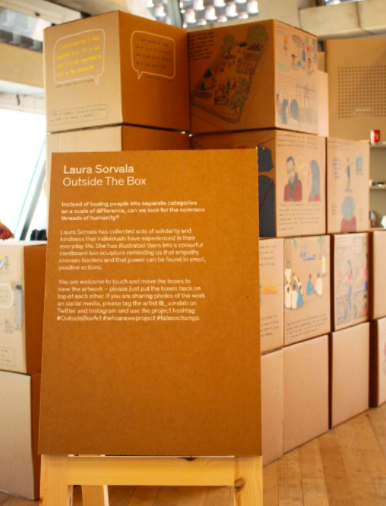 Laura Sorvala’s installation ‘Outside the Box’ provides a counterpoint to the depictions of an increasingly divided society shaped by stereotypes and resentments. As part of the Who are we? project at Tate Modern’s Tate Exchange programme she sent out a call via social media for stories that document kindness and solidarity that people have experienced in their everyday lives. 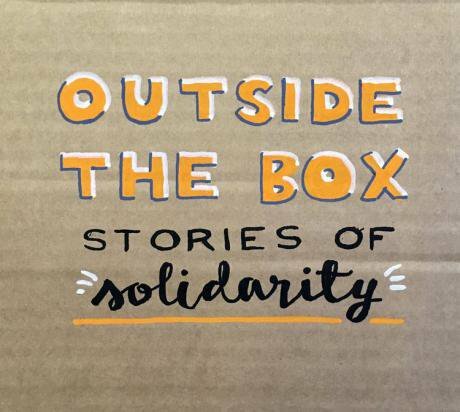 People were asked to share their stories on the project’s Facebook page, post them on Instagram and Twitter using the hashtag #OutsideBoxArt or send them to Laura directly via email. In a conversation we had in preparation for the piece, Laura said she was “interested in the personal and sometimes intimate experiences of acts of kindness or solidarity, the encounters or incidents that might happen on public transport, in a shop, gym, workplace or on a street corner. We witness empathy in our everyday lives regardless of religious, ethnic, religious or cultural expressions. 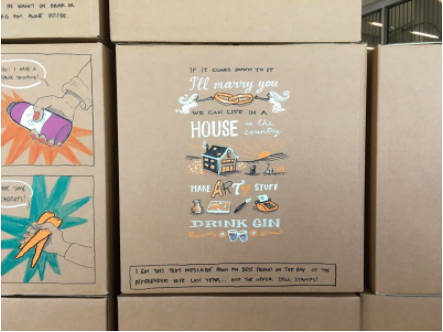 I want to encourage people to pay attention to these everyday situations, perhaps start instigating small acts of kindness.” Laura Sorvala, who as an illustrator and visual facilitator has long-standing experience of translating stories into colourful and accessible visuals, drew these stories on cardboard boxes that were assembled into an installation for the exhibition at the Tate Modern. Visitors were asked to move the boxes around and to contribute their own stories to the growing sculpture. 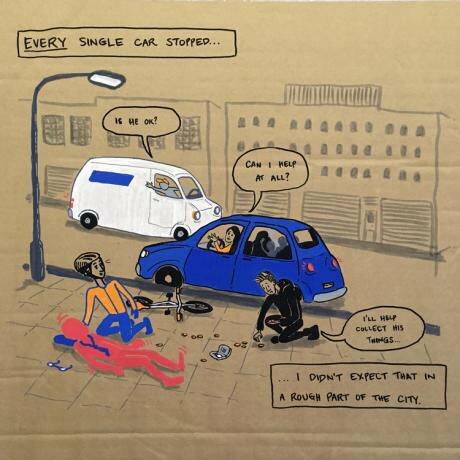 A number of sociological studies have drawn attention to the everyday situations of being together in ethnically and culturally diverse environments, which have become characteristic of life in big cities and other areas of Britain. Such situations allow for ordinary and unspectacular encounters with others in which difference is routinely rendered insignificant. In his 2004 book After Empire, Paul Gilroy suggested the term conviviality for these everyday experiences of living together in diversity. Convival culture is based in the ordinary human commonalities of sharing a workplace, a neighbourhood or religious congregation – or simply in being in the same place at the same time, and recognising each other as fellow human beings. Convivality is a powerful concept as it rejects any emphasis on integration or the need for shared and unified national identities. It also marks a departure from the principles of tolerance and recognition which are defined by the assumption of difference and, often, an implicit hierarchy of ethno-racial positions. Instead it renders racial (or other) differences unremarkable as they “do not… add up to discontinuities of experience or insuperable problems of communication”. Laura Sorvala’s stories can be seen as documenting such a convivial culture. 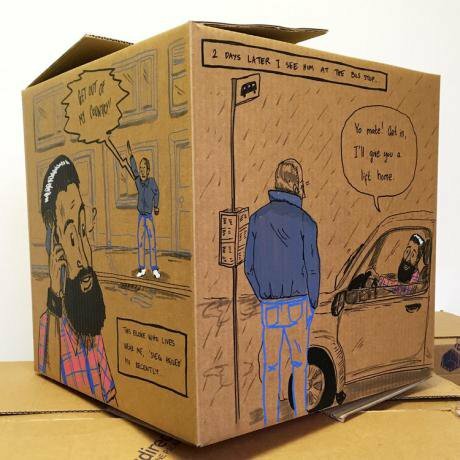 The title of her ‘Outside of the Box’ explicitly refers to the absence of categories like race, religion, gender or sexual orientation in everyday encounters, rejecting and challenging the processes through which people are marked out as others. Moreover, it demonstrates moral relations between fellow neighbours, citizens, and simply human beings who offer support and reassurance, enacting solidarity in everyday life. While more fleeting than any form of sustained activism, these acts can nevertheless make a big difference to our everyday experience, as Sorvala shows. Solidarities outside the box. Alena Pfoser. All rights reserved. Solidarities outside the box. Laura Sorvala. All rights reserved. Solidarities outside the box. Laura Sorvala. All rights reserved.Convivial culture and neighbourliness should not, of course, be idealised as though they are the usual way of being in cities and other places; living together is neither without conflict – the geographer Ash Amin has aptly called it an “experiment without guarantees” – nor is it detached from political and social developments as the increased number of hate crimes against ethnic and religious minorities after the Brexit referendum and the Manchester and London attacks show. Conviviality departs from the principles of tolerance which are defined by the assumption of difference and, often, an implicit hierarchy of ethno-racial positions. According to records from regional police forces, the number of religious and racially motivated crimes rose by up to 100% after the Brexit referendum, and British Muslims in particular have been confronted with a rise in verbal and physical abuse following the Islamist terror attacks in May and June 2017. When looking at everyday solidarities, we should be mindful not to forget that neighbourliness has become a political issue in itself. In 2001, New Labour placed local communities at the heart of its social policy, and David Cameron and Theresa May have put forward their own expectations in their concepts of a Big or Shared Society. Geographer Joe Painter has warned that in these visions “neighbours have become burdened with political expectations out of all proportion to their fragility in practice”. Firmly situated in the contemporary sociopolitical situation, Laura Sorvala’s stories resist depicting these idealistic scenarios of people “coming together to do good things in their neighbourhood”, but show the social contexts in which kindness and solidarities are enacted. Several stories explicitly articulate critique of a worsening sociopolitical and economic climate in which cultural and religious diversity are repudiated and inequalities have become heightened by the measures of austerity: an EU migrant who receives a support message after the EU referendum saying that she is welcome in Britain finds her status has been suddenly questioned. The pregnant woman on the London tube who remarks that the only person getting up from the seat is a drunk, acknowledges his act but at the same time complains about the lack of support she receives from others. 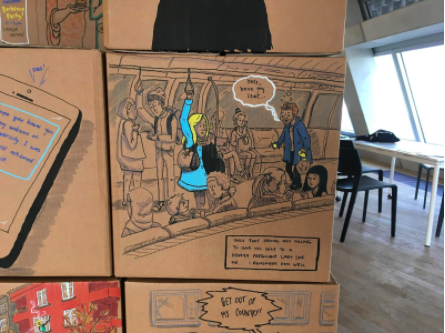 In this way, Outside the Box can also be read as a reaction to the dispossessions and displacements experienced by many in our society. Solidarities outside the box. All rights reserved.